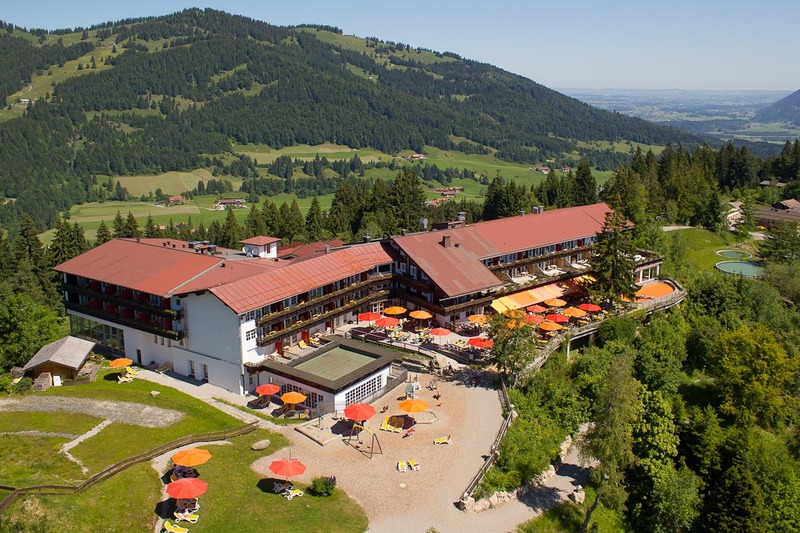 The MaPa-Spa of our Bavarian wellness hotel lies separated from the bustle of the family spa with the fun pool. Here you will find an oasis of peace and relaxation to enjoy some unwinding moments together or you can take a time out just for yourself. In order that you can unwind with a clear conscience, our devoted child care takes care of your kids in the meantime. Enjoy your wellness holiday to the fullest. While our kids are in the best hands in the kid’s club with entertainment and have big fun with contemporary playfellows, you can enjoy the 85°C hot Finnish sauna. Subsequently, allow yourself tingling refreshment at the ice crusher und quench your thirst at our fountain after a sweaty sauna session. In our bio panorama sauna you can enjoy the pleasant heat that loosens your muscles. While you are inhaling the 55° C warm, salutary steam, which make you sweat heavily, a magnificent view of the Allgäu mountain scenery opens up for you. We offer you the pleasure of a steam bath, pleasantly warm with its 45°C. The prevailing high humidity of 90% has a beneficent effect on your skin and bronchial tubes. Take a deep breath and let the steam act on body and mind. Those, who like it less hot, but still want to feel pleasant warmth on their body, can relax extensively in one of the infrared cabins of our MaPa-Spa. If you need a break and are in the mood for a nap between times, you can fulfil this need in one of the four cosy relax rooms with the extra comfortable loungers. Or enjoy the fresh mountain air in the wellness garden of the MaPa-Spa, from which you can enjoy the wonderful mountain view and the marvellous evening sun at the end of an eventful day. In winter, the very brave ones refresh themselves in the deep snow in-between of two sauna sessions.